Yesterday was the first official day of spring, but that didn’t stop me from wearing shorts while playing outside with my son and dog last week. Southern Kentucky has had some beautiful weather over the last week or so, and it’s finally time to start switching out my wardrobe. It’s also time for me to start seriously prepping my skin for a wedding. 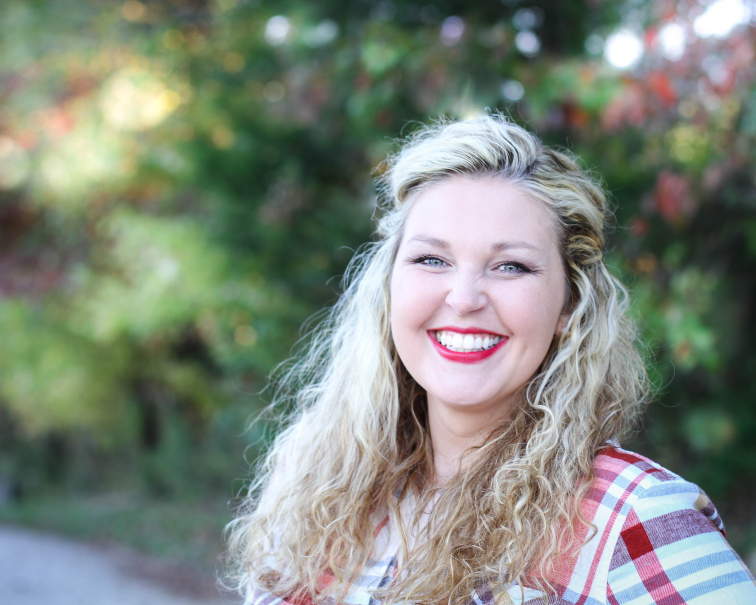 If you haven’t stopped by my site previously, you might not know that I’m getting married in just a few short weeks. I have a strapless gown, and I’m hoping that my skin tone doesn’t too closely resemble my dress. I won’t be out in the sun without sunscreen. Here are some of my best tips for how to get an even golden glow without sun tanning from a self-proclaimed sunless tanning pro. When I was in college my grandfather was diagnosed with metastatic melanoma. It had spread to internal organs, and he has had to fight for his life the last 13 years. I couldn’t undo all the damage that I had done to my skin by sun tanning and using tanning beds, but I could commit to stop using tanning beds and always wearing sunscreen. Last year, my mom had two skin cancers removed from her face. I reevaluated my skin care routine shortly after that. My velvety ivory skin is a hallmark of my primarily Scotch Irish heritage. I’ve lost count of the many sunburns I’ve received in my life. In college, I was really rough on my skin. I was a cheerleader, and we should spend hours outside practicing and performing at football games. I finally made a commitment to myself that I would only use sunless tanners. I started using Jergens® skin care products a long time ago. Two of my go-to sunless tanning products are the Jergens® Natural Glow® +FIRMING Daily Moisturizer and the Jergens® Natural Glow® Color Primer. The biggest problem that most people have with using self-tanners is that they don’t exfoliate well enough before application. Dry, scaly skin prevents a smooth application. You need to keep your skin well hydrated inside and out, which includes drinking lots of water and regularly using moisturizer. If you look closely you can see the beads in the exfoliator, that help remove dead skin. Purchase the appropriate shade of sunless tanner for your skin type. I use Jergens® Natural Glow® +FIRMING Daily Moisturizer Fair to Medium. It’s easier to start using a lighter product, and then move darker if necessary, than it is to begin with a darker product. Using the wrong color can make your skin color and tan look less realistic. I heavily use a moisturizer all over my body the day before I apply any product. This will help prevent you from completely drying out before you use the exfoliator. 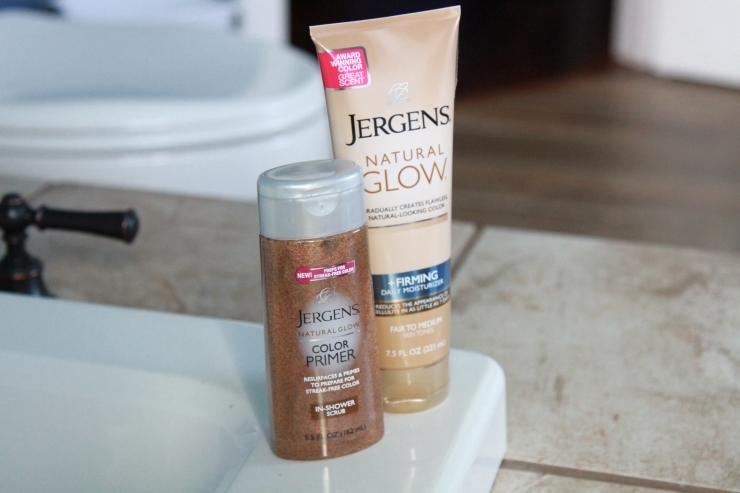 Apply Jergens® Natural Glow® Color Primer exfoliator while in the shower. 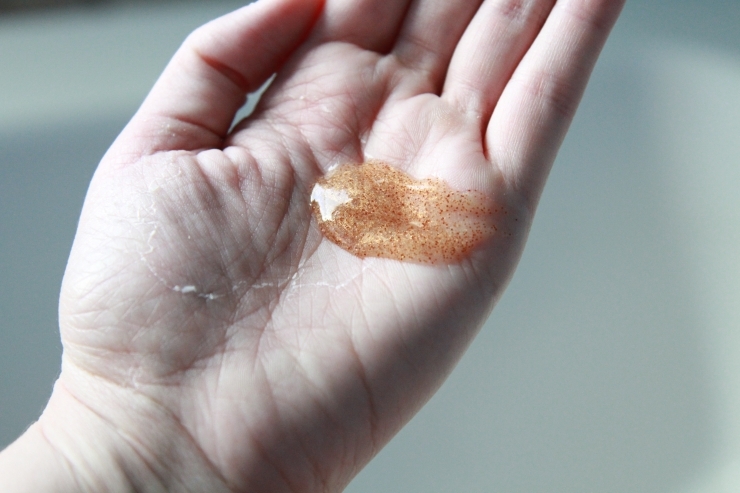 Gently but thoroughly rub the exfoliator around, to slough off any dead skin cells. Rinse off the exfoliator well. 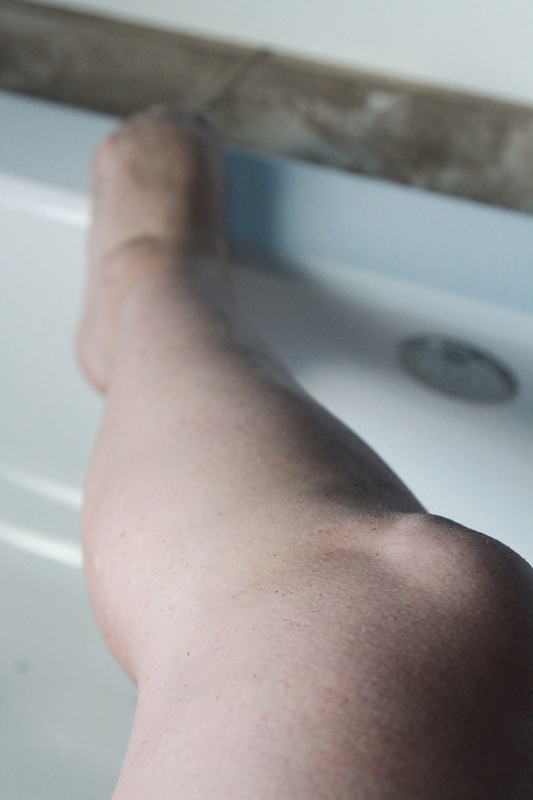 Consider using a moisturizing body wash and rinse well. Pat skin dry. Your skin shouldn’t be soaking wet or bone dry when you apply moisturizer to promote even absorption. Apply a light coat of regular moisturizer to dry areas like knuckles, knees, ankles and in between fingers/toes. When I’m using an instant self-tanner, I generally put some type of polish on my fingers and toenails. My nails stain easily and that helps to ensure that the color doesn’t absorb into my nails. I also take a cotton swab and moisturize, and wipe out my nail beds and under finger nails when I’m done. 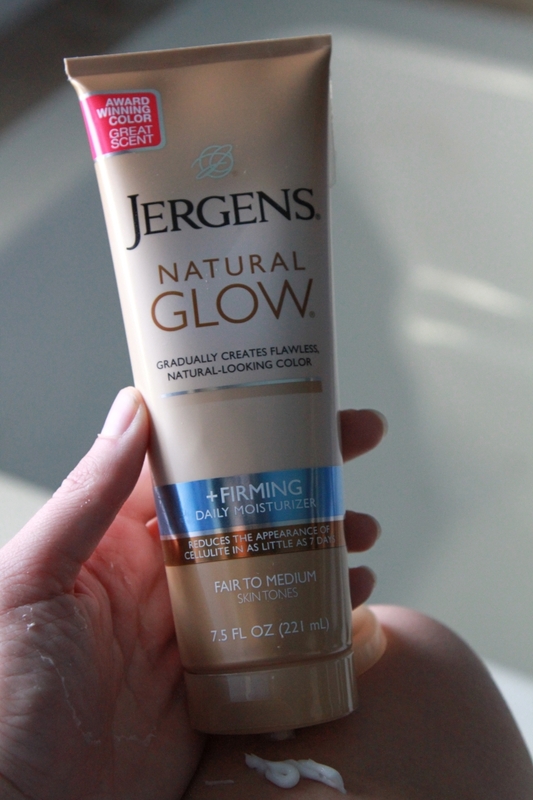 Apply an even coat of Jergens® Natural Glow®+FIRMING Daily Moisturizer across your body. 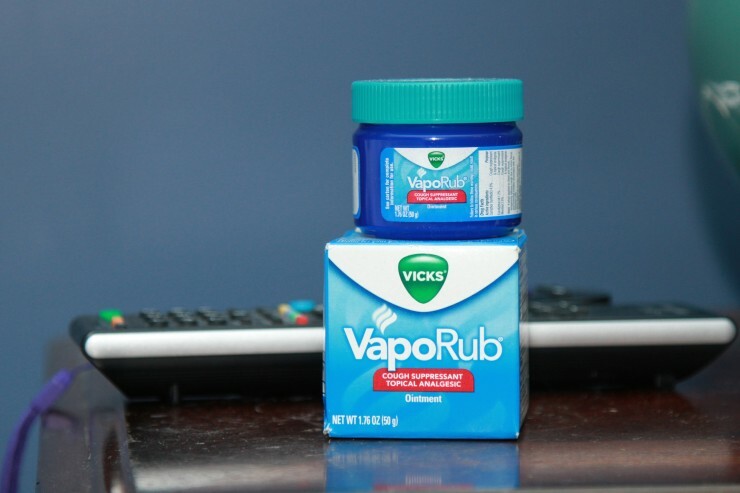 Use sparingly on knuckles, knees, ankles and in between fingers/toes. If you notice any discoloration on your hands or feet, apply Jergens® Natural Glow® Color Primer and rinse well. Apply daily until you reach the desired color, then apply a few times per week to maintain color. Keep your skin well moisturized and exfoliate at least once a week. I wish I could have shown you the difference on my arms, but I broke my hand a few weeks ago. It was bandaged up for weeks, and my skin is still peeling. I don’t suggest using sunless tanner anywhere that you have peeling skin. You can have issues with discoloration. I’ve barely been using the product for a week, and I can see the difference. Here’s a skin care tip that people often forget. Regularly apply sunscreen to the tops of your feet while wearing flip flops or sandals. People often neglect to use sunscreen on them, and especially when you’re wearing pants with those types of footwear. Your feet stay hidden behind socks and shoes during the winter, and it makes them more prone to sun damage and sunburn. 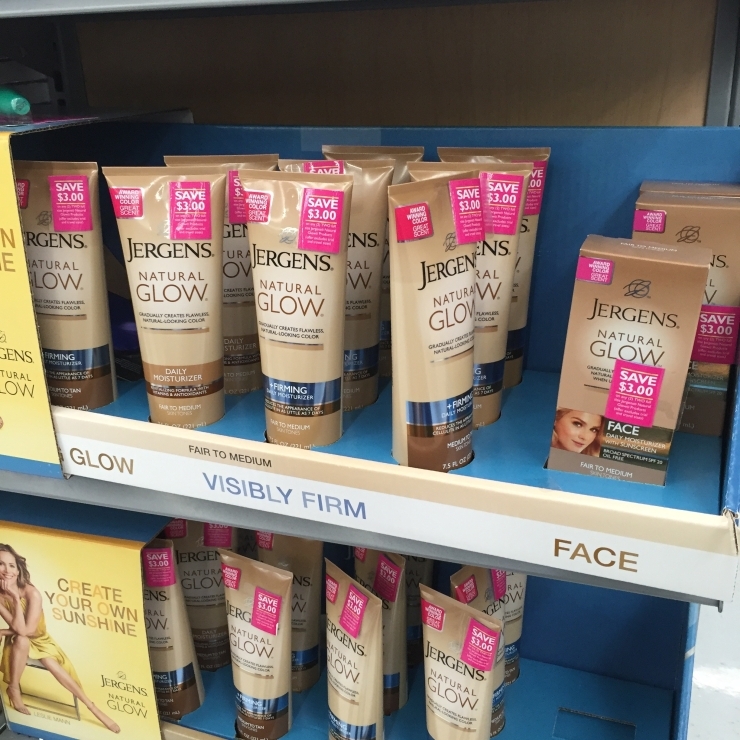 I found all of my favorite Jergens® Natural Glow products on an end cap at my local Walmart. The bottles had a coupon on them to save $3.00 on any 2 full size Jergens® Natural Glow® Product (Offer excludes trial and travel sizes). Are you ready for spring? Have you been out in a sundress or shorts this year? Maybe you’re trying to get your skin ready for your wedding day too? If you’re looking for the sun kissed look on your skin without the sun, follow my tips for how to get an even golden glow without sun tanning. 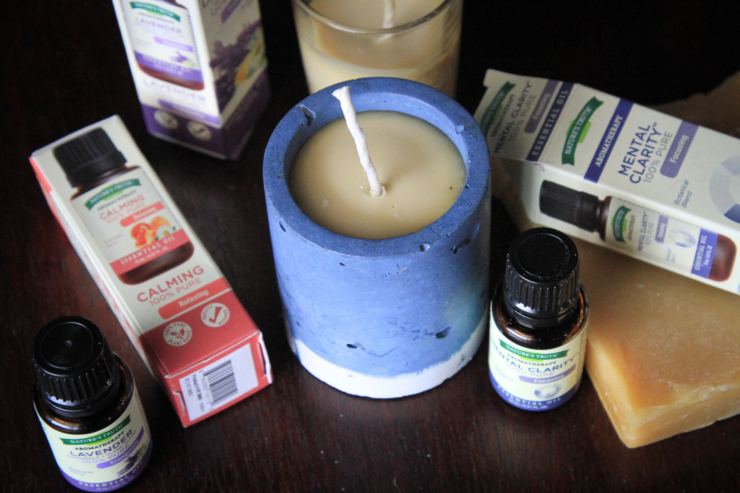 What do you find soothing when you’re sick?